Yes, I realize I used the wrong kind of “tail” in the title of today’s post but read on and you will understand. Monday was the day to finally attack the rolltop desk in my office. It had remained closed while we showed the house a couple times over the weekend for good reason. It doesn’t look that bad when it is closed other than the stuff sticking out the drawer that I just noticed. But when it is opened. Oh boy. Let’s just say my traveling lifestyle as of late has played havoc on my housekeeping. I have been able to keep the house in “show-ready” state and thanks to my friend Jeni who makes sure the place is dusted and cats checked on if there is a showing when I am gone the rest of the house is pretty good. 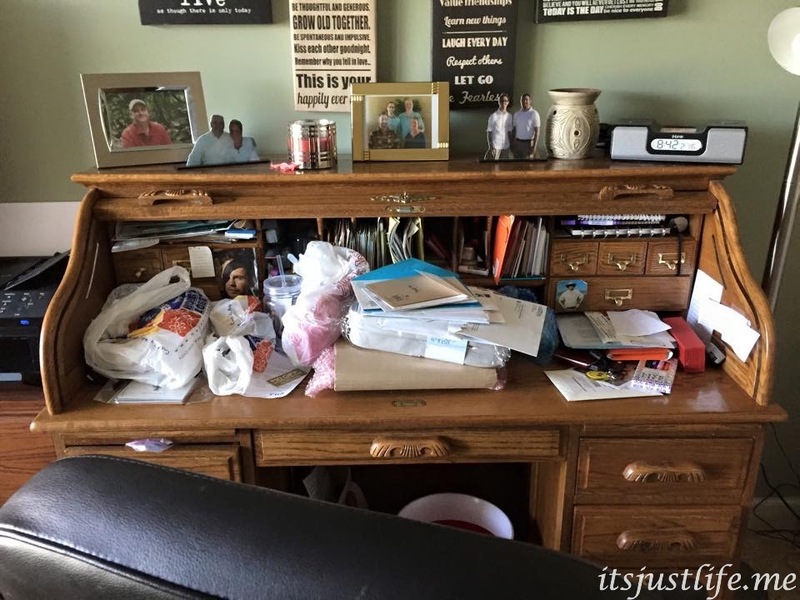 But my desk had become a collection place for presents to be mailed, mail to be sorted and filed, card making supplies that needed to be put away, etc. Monday was the day. Chris left on Sunday and I had one day set aside for house cleaning, 2 days for card making for Hospice and 1 day for hair appointment, packing and odds and ends before going to Ohio for the weekend. So Monday I did it.Still not perfect by any means because the cubbies are filled but it is much better and is staying that way right now. I started the card making and was happily working on those early when I cut myself. Or I thought I cut myself. I actually did but then there was more red on my desk than could come from the tiny paper cut I had inflicted upon myself. Buddy looked guilty. Very guilty. And then I saw it. At first I freaked out. I have been doing a lot of that lately for some reason. I thought he had burned it. But upon closer investigation I realized that he had just dipped his tail in my candle that I had blown out. 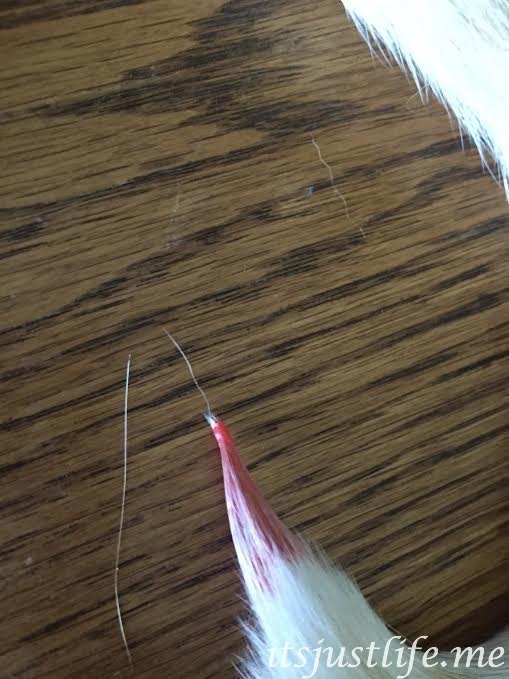 (See arrow in photo above) He did not burn it –he just embellished his tail with red wax. Which he proceeded to fling all over my desk and pictures as he flipped his tail back and forth. It was almost like a perfect pencil point tail. I am not a bad cat mom. I really am not. But this had me baffled how to get hardened wax safely off the tip of a cat tail. Apparently I am not alone in my dilemma because there were about a zillion Google references about how to remove wax from cat fur. The suggestions ranged from using coconut oil, baby oil or even egads—using a hairdryer to soften the wax in order to take it off. Now if you are a cat owner you might avoid that last one. Cat + hairdryer = frantic clawing cat and 1 scratched owner. So I have been working on it slowly, bit by bit and today it is almost back to normal. The old warm wet washcloth has worked well and he has tolerated me brushing it out a bit so that I can get the icky stuff out. He is such a mellow cat, thank goodness, that he has allowed me to pick at it bit by bit, separated the fur and hopefully by the time this post goes live the red tailed cat will be a thing of the past in my house. Just when you think that life is a bit dull (which is never the case in my life these days) something happens to spice it up. How about you? What has spiced up your week this week? Remember to comment for Mercy Foundation Birth Center. 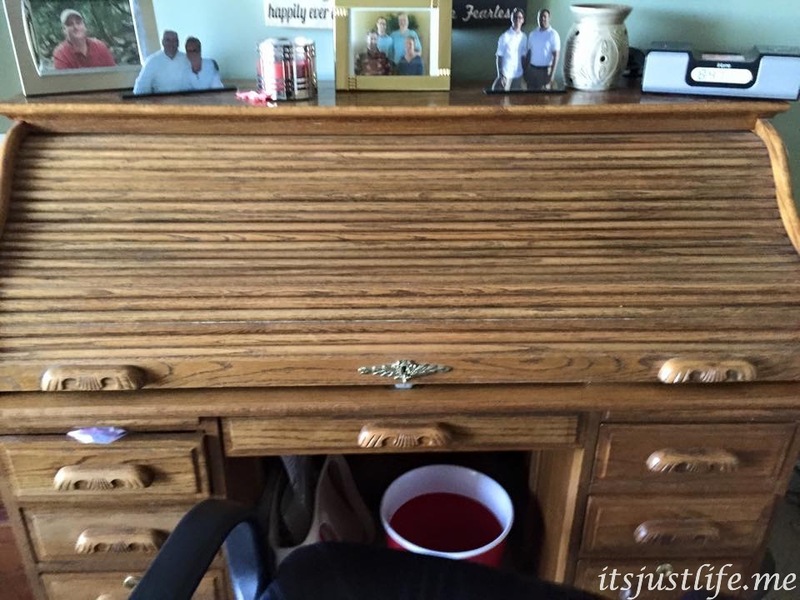 My favorite piece of furniture is a roll top desk I found in the trash. I spent two weeks to restore it. They are wonderful pieces of furniture. I waited a log time to get mine and even though it is not the popular furniture choice today I won’t ever get rid of it. I bet yours is beautiful, Carl. Oh Beth Ann…..I have gotten a kick out of this tail! I have one to share…New Year’s Eve 1999 going into Y2K…remember how most of the population was stocking up on supplies and going frantic about the possibility of the computers not working when we rolled over the new year? Well Dave and I didn’t get wrapped up in that nonsense and we were having our normal New Year’s Eve traditions of watching movies with the kids and I had lit my bayberry candle (my mom always believed and still believes that burning a bayberry candle on Christmas and New Year’s Eve brings prosperity for the new year). So, I was in the kitchen adjacent to the candle burning on the breakfast table and Dave was down in our living room right next to the breakfast nook….both he and I started smelling something dreadful burning. Pretty soon Dave sees a flash of our cat Garfield running towards the patio doors and his tail was on fire! Fortunatey, by the couple seconds it took Dave to run to Garfield’s rescue, the fire went out. But the stench of that burnt cat hair was so bad that we had to open doors and windows on a 20 degree night to let the smell dissipate! Garfield obviously had pranced around that candle on the table and swung his tail into the flame! Thankfully, the tip of his tail that just has hair was the only part that burnt…not his skin! That was our Y2K story! Oh my goodness!!! That is quite a story and yes—the smell would be horrific! I am glad it is not just me that these things happen to!!! Thanks for sharing! Love this! You always seem to have quite the adventures! Okay, I couldn’t resist….did kitty want a wax job to have a fur-free tip of his tail? Tell him one of those no-no hair remover thingies they advertise on TV is safer. 😉 Kitties do manage to get into things they shouldn’t. Did you see my post yesterday? . Chris said he wanted a Brazilian! 🙂 Checking out your post—I think I missed it. Your desk looks so pretty and organized now! Well it is better. I would not say it is perfect but at least it is able to be used for what it is supposed to be used for! I was just waiting for this post? I love his pointy tail. You knew it was coming, didn’t you? Oh Buddy. It is just a slight tinge of pink today and not bad at all. Now I understand your cat wax tail comment from the other day… I love it that this has happened to many cat owners and not just you! Apparently it is a “thing”. Never a dull moment in your life!! Poor buddy, I bet he wondered what happened. We have been moving into our place here in Spain. Am surrounded by boxes but slowly getting it together. It will take awhile. The place is much smaller than we are used to so finding places for everything is a challenge. I am so glad you have a home now! How exciting! I need to catch up with you! I have not been good at visiting blogs and staying in touch with people the past month and I intend to change that! Oh man thankfully your cat didn’t burn itself! Today the water is once again shut of with no warning. It happens a lot in our town and it’s usually for hours. Very frustrating. We already have to pay for water we can’t drink, then buy water we can. We don’t get any compensation when the water is shut. It’s a good thing I didn’t have to be anywhere today. I know! I am usually very careful and very aware of where the cats are when I am burning candles but this time I did not think of the melted wax. Obviously. I am sorry about your water. Why do they keep shutting it off? Any clue? Well you had a colourful cat! 😉 This time it’s a water main leak. I just wish they’d give us notice so we could be prepared. Ugh. Hopefully it will be fixed soon! A great cat story!! Glad we share a love of cats! My only good cat story is that I tell Leslie that every day the cats ask if today is the day that Leslie comes home. They know (because they keep up with her) that she will not be home for another few weeks, but they ask anyway. Well, then they saw the photo of Leslie holding the goat? And they are beyond hurt that she would do that. So more of a crazy Virginia story than a crazy cat story! I bet the cats were way beyond hurt to see Leslie sharing her affections with a goat of all things. Goodness. Buddy’s tail is almost back to normal now. Whew. 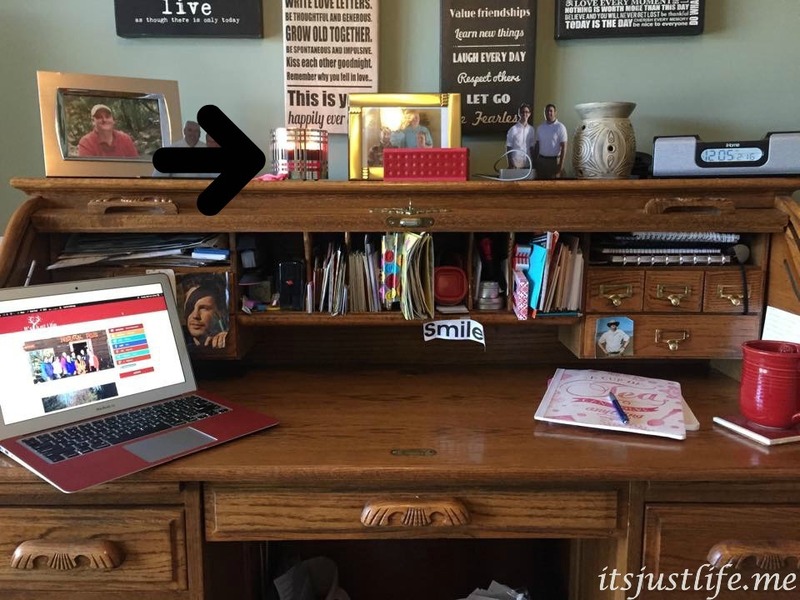 You are a brave girl to post “before” photos of your desk! 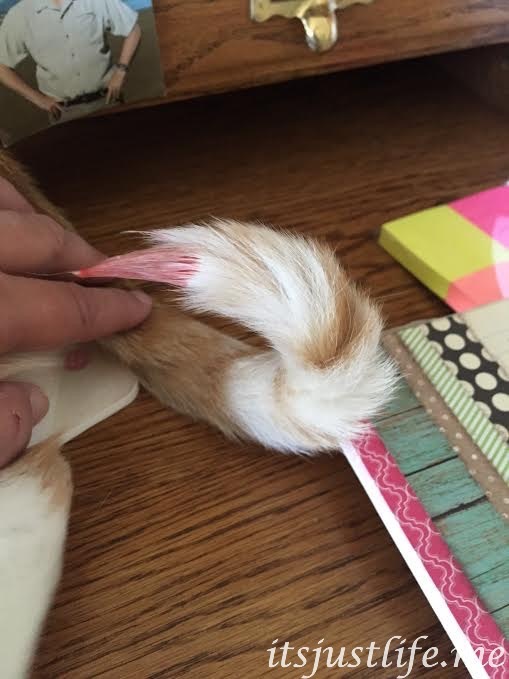 Glad that the wax is almost gone from your kitty’s tail! I know I am, aren’t I? It was a mess. It has stayed clean for 2 days….. Cute story! I never thought about that happening to my cat, but now I will. One day there was a terrible smell in the house which I couldn’t identify until I petted my cat from tip to tail and felt the singed fur. She’d jumped up on the stove, where she most definitely wasn’t allowed, and scorched her tail in the candle that was burning there. It gave me the shivers to think she could have set the whole house on fire. Oh goodness! Yes— that would have scared me as well! Yikes! No your days are never dull! Hopefully some relaxing is on your schedule this weekend! I am glad your cat did not get burned. It could have been worse. It could have been really bad. I am very careful with candles and this one was blown out and cooling when he flipped his tail in it. I try to keep an eye on the cats but this time he was too fast. Holly is staying far far away…. Smart lady there.. Though I wonder, if like Eve, she was the temptress to poor Buddy’s Adam..
It’s always something with pets, isn’t it? You sometimes have to be a real detective to figure out what has happened. The desk is not always as cluttered as this –I really do try to keep up with the papers and mail more these days but sometimes it does get out of hand. Ugh.